Challenge implies obstacles, opposition, or a test. Challenges often require “uphill battling,” perseverence, and intestinal fortitude. Challenge can also include…wait for it…pain (ouch!). Pain? Really? Yes, really. This is often the challenge of challenges, the pain of going through them. Another way you can look at it is as fear. Fear of the unknown, fear of the process, fear of change. Whether it’s fear or pain, the truth is, challenge often (if not always) includes some degree of discomfort and adjustment. It’s this discomfort that often keeps people from taking the steps necessary to meet and overcome the challenges that inevitably stand between where you are and where you want to be…your potential. That’s the bad news, there’s likely going to be some discomfort associated with your challenge. But there is also good news, that same discomfort has several positive effects. First, it can be a powerful motivator. Discomfort can spur you on to action like few things can. Pain and discomfort can compel you to change and push you to get through it faster. Second, pain can guide you, much like the bit in a horse’s mouth. The discomfort associated with particular challenges can let you know that something needs to change in your life. The challenge you’re up against may be there for the purpose of introducing needed change to your life. Third, the discomfort of challenges can serve as a measuring tool you can use to determine exactly who you are on the inside. It’s been said that hardship doesn’t develop character as much as it reveals character. Pain can gauge your commitment to your goals, your priorities, reveal your level of maturity, and the depth of your faith. It can also serve as a guard against something worse. The pain of one challenge may keep you from even greater pain associated with another challenge, one you might have been more inclined to take on. While you’re busy taking on one, you’re preoccupied from taking on the other. 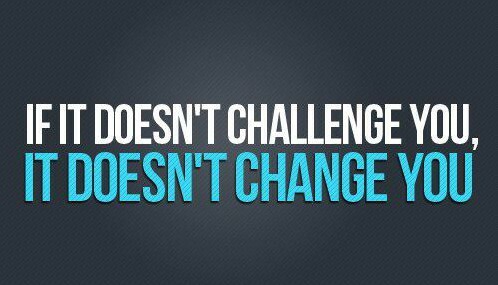 Now, here’s another challenge to consider: How will you deal with the challenges within the challenge you’re facing now? Maybe you’re not sure which of these positive traits of discomfort applies to you, or perhaps another one not mentioned. Maybe you could use help deciphering your situation and determing the right way to move forward. Some aspects of the challenges you face can be more productive with the help of a partner who can see blindspots you may be missing. Well, that’s what I do. I help people just like you clear away the cobwebs and gain a clearer vision of the future and embrace the challenges that lie before them. Give me a call and let’s see if we can move you through your challenge to your potential.